We’ve seen dried apple chips – either sold in packets as a healthy alternative to potato chips (crisps as we say in the UK), or used as a garnish in desserts – so why not dried rhubarb chips? But when I first saw pretty dried pineapple sunflowers decorating an exotic fruit dessert a few years ago in Paris (at Ze Kitchen Galerie), I just had to make them at home. And they’re so easy! 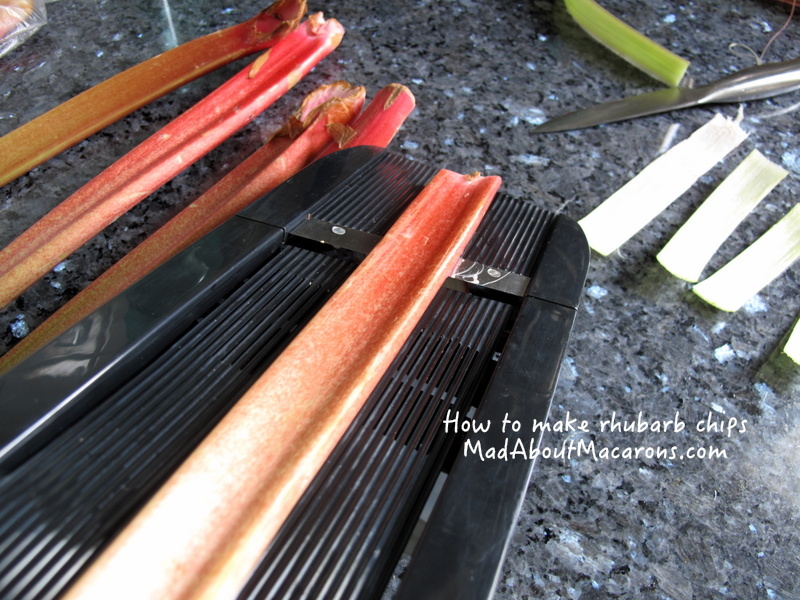 After trying them out successfully in my own kitchen (well, not that successfully: I just missed cutting my thumb to the nerve using the mandoline), I tried it out on rhubarb too, using the same simple method – this time being a lot more careful with the mandolin’s blade – and it worked! The lightly coloured rainbow-like ribs along the stalks look rather arty, don’t they? 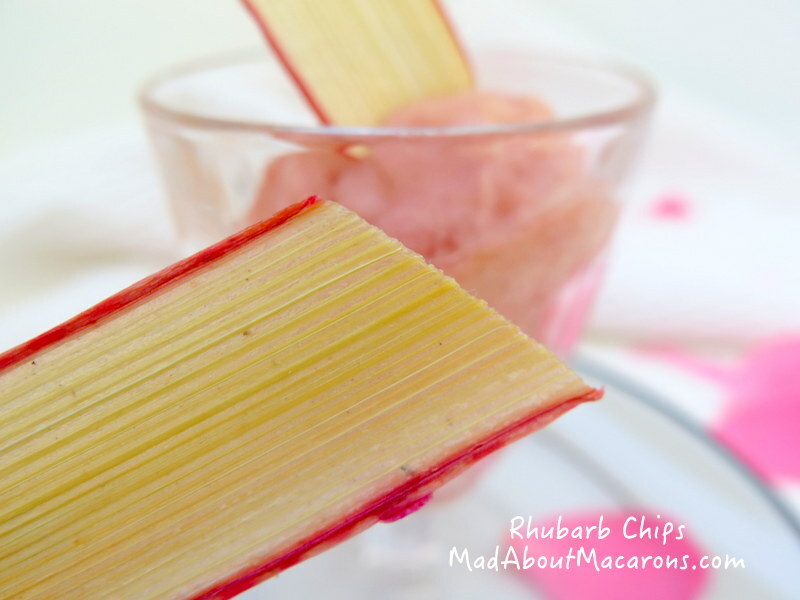 Either you love rhubarb’s tartness or not, but use it to your advantage to surprise guests with these arty chips on savoury dishes such as Foie Gras, terrines or pâtés. 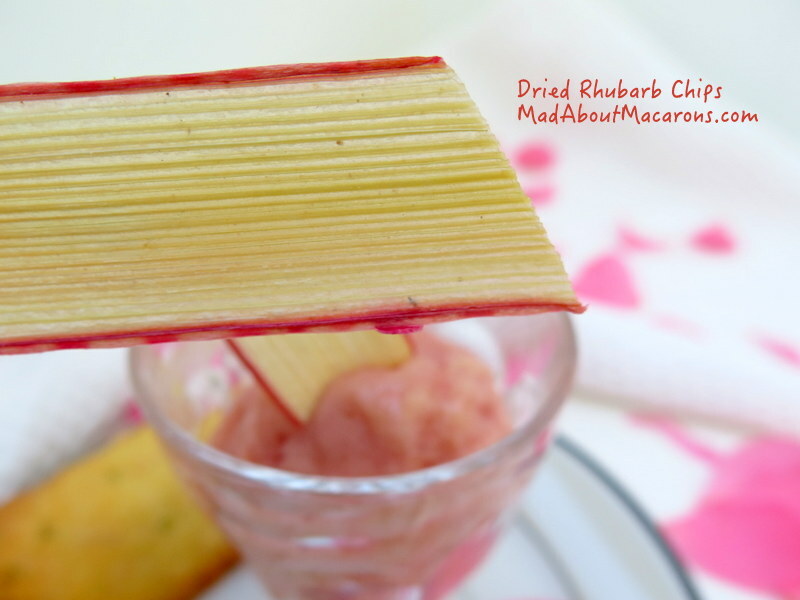 Add them to this rhubarb and rose sorbet or other rhubarb desserts such as rhubarb & strawberry gratin. Or try on lemon ice cream for a real tart dessert! The good news is that they can keep for a couple of months if stored in an airtight container. Bring the water and sugar to boil in a saucepan. Transfer the rhubarb to a long shallow dish that will hold the rhubarb slices, depending on the length you wish to create for each chip. Pour over the hot syrup, ensuring that all the slices are coated. Cover the dish with cling film (plastic wrap) and leave to cool for about 15 minutes. Preheat the oven to the lowest setting you can, around 90°C/200°F/70°C fan. 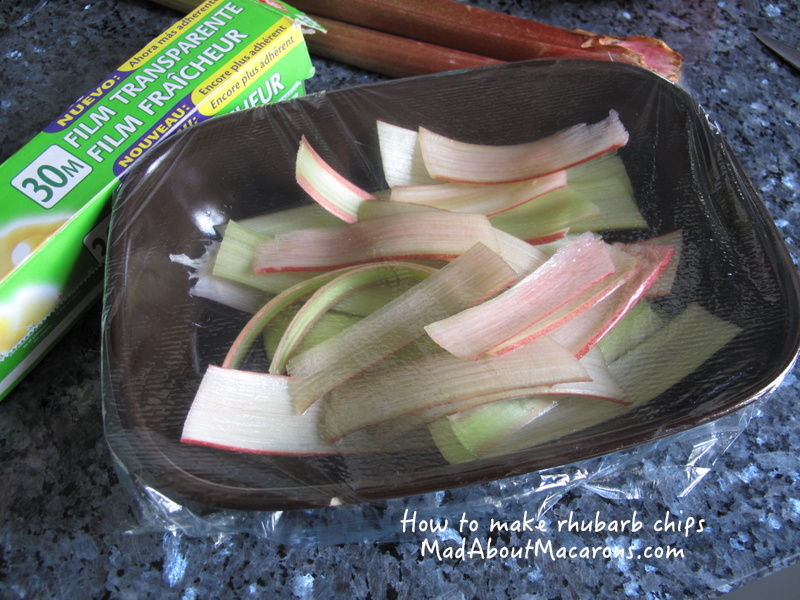 Dry the rhubarb slices on kitchen paper and place them on non-stick trays. Dry in the oven for about 2 hours. Keep an eye on them after 1h30 mins, to ensure they’re not darkening. Ready to use, otherwise store in an airtight container in a cool place – can keep for up to 2 months. Ideal garnish for Rhubarb & Rose Sorbet and all sorts of rhubarb dishes. Even savoury! The tartness will be fun to match up with Foie Gras, terrines or pâtés, for example. Use the same method to dry apple and pineapple slices. 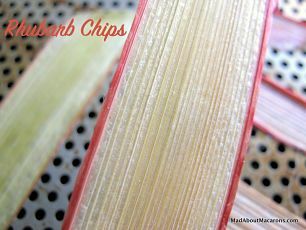 Dried rhubarb chips what a great idea Jill. I love the idea of putting them on lemon ice cream. Yes I do think the coloured rainbow-like ribs along the stalks look really arty and very special. I adore this, Jill!! You know how much I love rhubarb, and these would NEVER last 2 weeks, let alone 2 months in my house! I hope I can still find some rhubarb in the stores as I really don’t want to have to wait a year to try this! FAB! For savory do you still need the syrup?